Phat Lewts' Gold Blog: Never Delete Creaturecache.wdb for _NPCScan Ever Again! Never Delete Creaturecache.wdb for _NPCScan Ever Again! If you like my posts follow me on twitter @PhatLewtsGold! Today I'm going to write a quick post about how to easily never have to delete your creaturecache ever again. If you don't already know what it is, this is the file you have to delete to make sure the addon _NPCScan can find rare spawns you have already seen in previous logins. This file is found in your World of Warcraft folder under /Cache/WDB/enUS/creaturecache.wdb. Just to note, I originally found this out from a comment on wowinterface.com and wanted to share it with you guys. That's it, now every time you logout and WoW tries to make a new file detailing the rare spawns you saw, it'll be read-only, so WoW won't be able to, and you never have to delete it again! Right click creaturecache.wdb and select properties from the drop down menu. Click the general tab at the top, click the check box for read only, then hit OK. Right Click creaturecache.wdb and select "Get Info" from the drop down menu. 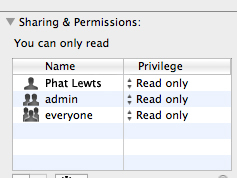 Under "Sharing & Permissions:" set Privileges to Read Only. I just did them all because hey why not? Hope you all enjoyed this tip! I've heard reports that doing this can mess up the game when it goes to update itself. Just to be safe I'd undo this before a patch. Personally I prefer to just use a simple batch file. Copy and paste that block of text above into notepad, then save it as something like "Start.bat". Then when you want to play WoW just double click that, which will automatically delete your creaturecache and npccache before launching the game. I feel this has the least potential to screw something up on patch day, like Jim said. That is how I've had my launcher set for about a year and has worked just fine through many patches and I'm still hunting rare spawns in game without issue. Any idea how to create such a file for a MAC?